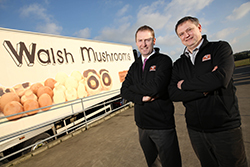 Walsh Mushrooms Group has acquired the business and assets of Gol den Mushrooms, one of Ireland’s top mushroom growers. Walsh Mushrooms Group is the second largest mushroom supplier in the UK market place, with operations in Ireland and the UK in compost manufacture, mushroom growing, marketing and distribution. The move, which comes amid on-going volatility in the Irish Mushroom sector in the wake of Brexit, can be seen as a significant show of confidence in the future of the Irish mushroom industry. This move safe guards the continued supply of mushrooms to our UK customers. Walsh Mushrooms Group currently markets over 26,000 tonnes of mushrooms per annum, accounting for over 15% of the total UK mushroom market. The acquisition brings total group employee numbers to 380 people across four sites in Ireland and the UK and boosts the groups own production capability to 7,280 tonnes of mushrooms per annum. Padraic O’Leary, Managing Director, Walsh Mushrooms said, “We believe that this acquisition will serve to further strengthen the Walsh Mushrooms Group, building on our recent significant investments in our production and packaging facilities in the UK. Golden Mushrooms has grown into a successful business over the last 18 years and we have long admired the production facilities and staff. Their strong commitment to sustainability, with the presence of a biomass facility on site, was key for us and strongly aligns with our group environmental policy”. Commenting on the current uncertainty in the Irish mushroom industry, Padraic O’Leary said, “The last seven months have certainly been incredibly difficult but we are confident that the sector will overcome the challenge created by Brexit. The fact is that mushrooms are the second largest vegetable category in the UK, yet the market is not self-sufficient and needs to import 50% of their mushroom requirement. A long-standing, strong relationship exists between the Irish grower and the UK market and we are confident that ultimately the UK will return a more sustainable price for Irish mushrooms reflecting the new, post Brexit, foreign exchange rates”. Golden Mushrooms founded by Michael and Marian Bergin, began operating on a site outside the village of Golden in Tipperary in 1998 and quickly grew to become a significant producer in the Irish market employing 90 people and achieving turnover of over €5 million. The business will trade as Walsh Mushrooms Golden Ltd. Founder of Golden Mushrooms, Michael Bergin said, “We are proud to have grown a successful business from scratch and are delighted to see it, and our loyal employees, continue to operate under the new ownership of Walsh Mushrooms Group. We have worked closely with Walsh Mushrooms Group for the last 15 years and greatly respect their continued support and confidence in the Irish mushroom industry”. Walsh Mushrooms Group was founded in Gorey, County Wexford in 1979 and now operates across four sites in Ireland and the UK including the newly acquired mushroom production facility in Golden, Co. Tipperary; a compost manufacturing facility in Gorey, Co. Wexford; a mushroom production facility in Suffolk; and a packing and distribution facility near Evesham in Worcestershire, UK.